It wasn’t as hot as we had hoped it would be. The temperature didn’t exceed 40°C which is strange for this part of the world this time of year. But that’s not all: it also rained. It rained on us while camping in the desert where the average rainfall is a scant 230mm a year. Go figure. My friend Carl, who was heading the trip, invited me to join the five-day backpacking trip in the semi-arid Australian Outback as a wilderness guide. The trip is organized by a private school near Melbourne for their Year 11 (11th Grade) class. It is the last installment and the most rigorous of their Outdoor Education program. In previous years these students have visited mountain, marine and forest environments and now they must face the most famous, and harsh of Australian environments – the desert. We drove over 1000 km north from Melbourne past the town of Broken Hill to cross the border into South Australia and onto Plumbago Station. From here the kids, nearly sixty of them, split into two groups to walk the loop trail in opposite directions. I was assigned to the clockwise group and once we had picked our navigators for the half-day trek to our first camp we were off. 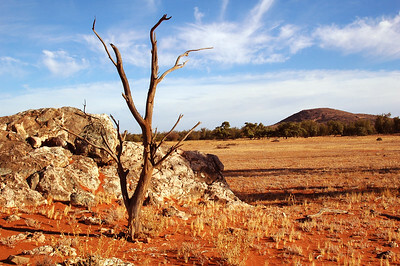 The red dirt, of the Australian Outback, soon coated our boots and legs. (Over the week that red dirt would lodge itself in various unexpected places on our bodies and in our packs). The kids did well on the first day, which was only a half-day of hiking. Again, it wasn’t really that hot. But the desert was quick to remind us how dangerous the heat can be and that death is never far away. The sparse remains of a kangaroo – a few scattered bleach white bones, a skull and some fur – attracted the interest of some of the kids who likely had never been so close to a carcass of any sort. By the end of the trip, seeing these bodies in varying states of decomposition became old hat. And while some of the students were still disgusted by it, they simply walked by, glancing at it for only as long as it took to pass, but still heeding the warning it contained. Our first evening, we strolled into camp a bit later than expected and after setting up, our dinner lasted well past sunset. The students were assigned to cook groups of two to four and they had each worked out their own menus. We never built any open fires, but instead sat in a large circle to include all 30-plus kids and leaders. Each group had their own methyl alcohol stove and managed their own system of cooking and cleaning up. The atmosphere was completely transparent, and the darkness of outer space beyond infinitely black. Each star had its place and part in the dazzling light show above. I awoke in the middle of the night to a slight chill and the flapping of my bivouac bag. The wind had picked up and the waning gibbous moon was still nearly full and shone like a street lamp. It felt like I’d gone back to sleep for only just a moment when I heard Carl starting to stir on the other side of the tarp we had laid out in a dry sandy creek bed. It was 5AM, and I only believed it because the moon and stars had substantially rotated through the sky. There was still no sign of the rising sun, but it was time to start rousing the kids. Each morning we woke well before sunrise in the hopes of getting on the trail at sunbreak to hike in the cool morning air and be at camp and resting in the shade during the hottest part of the day in the afternoon. The cooler midday weather this season didn’t help with this motivation. Because it wasn’t as hot as usual during the day, the students had a hard time with this concept. In previous years, Carl told me, they often wanted to get up earlier to start hiking, even before sunrise, because the heat became so brutal by midday. We took all the precautions to combat the heat nonetheless. Most notable was our method of carrying water. We used canvas water bags that were kept cool by evaporation. The bags held seven to eight liters of water and had to be pre-soaked (inside and out) to swell up the canvas threads. While we were hiking, we hung the bags from a wooden dowel handle and carried them by hand. Water would slowly seep out of the bag, evaporating from the surface, keeping the water inside cool. It acts much the way our bodies keep cool by sweating. While hiking, our course was not as straight as it could have been. Not because of impedances or bad navigation, but because we would zigzag from one shady spot to another for our frequent breaks. These shady spots had to be big enough to accommodate the entire walking group, which was only about fifteen students and a handful of leaders. Each morning we broke into two smaller groups and started about half an hour apart to help break up the herd. Our lunch break on the second day was just below a minor pass amongst the red rocks and under a deep blue sky. The clouds were sparse and the sun at its zenith. After eating and resting, one of the leaders who’d worked the trip last year pointed out a small cave further up the ridge . In front of the cave on a rough rock slab making somewhat of a patio, lay the carcass of a well decayed kangaroo – mostly just bones and fur. It probably just died from heat exhaustion and a lack of water, but it made the small cave look like a dragon’s lair with the discarded bones of its victims strewn out before the entrance. With unnecessary caution, I moved past this victim of the dragon (rather, the hot fiery breath of the desert) and crouched down to peer into the cave. A storybook covered the walls. The only aboriginal symbol I had been told about was the one for kangaroo, so all I understood of the story was a kangaroo hopped by. There were other inscriptions surrounding the hopping kangaroo. Most of the writing on the wall was in white, but some was in red, I’m not sure what that signifies, if anything. The cave paintings weren’t so much a mystery to me as was the idea that people had lived out here. They uncovered the secrets of survival and built a society. Later in the trip we found more cave drawings, but not as distinct as the last. Just before arriving in camp that day we climbed up onto a large rock outcropping to another feature of the Aboriginals – a specific element in their method of survival – the cisterns. To save water after rainfall they would carve out large holes in the flat rock. To weaken the stone they would build fires then chip away at the weak spot with other rocks and sticks. Some of them were only a meter across and 20cm deep, while in the deepest of them a person could hide standing up. To minimize evaporation, sticks and boughs were laid across the opening to shade and preserve the water. Speaking of rain… a suspicious layer of clouds rolled in on one of the last evenings of the trip. Everyone had pretty much laid their stuff out in the open to enjoy another night under the stars. By giving us a little warning, these were the nicest rain clouds I had ever come across. The first phase of rain was hardly a spattering; maybe a hundred drops fell total. But those drops were enough to mobilize the troops to get tarps set up. The second phase was a bit more involved but not much. By then most of tarp city had been erected as the rain started. I was happily stuck under a tarp cooking dinner for Carl and me as he and others scurried around to check on everybody and help where needed. It only rained overnight. The clouds remained in the morning with a small gap along the eastern horizon making for a brilliant sunrise. But once the sun climbed higher it stayed behind the same clouds that this time held off from precipitating while we hiked that day. Our last camp of the trip was at the base of Tombstone Mountain. After a rest from our day’s hike over some smaller hills and through the grey-green saltbush scrub we took the group up to the summit of Tombstone. This is when it did decide to rain on us. We were unfazed if not grateful for the cool rain after our hike. The view from the summit offered a clear visual of the landscape we had covered the past few days and looking ahead we could see tomorrow’s, the last day’s goal. That night the rain returned. Some poor tarp strategies along with leaving boots out in the open made for some soggy kids and hard lessons learned the next morning. We hiked along the rare occurrence of standing water in small puddles on the desert floor. The clouds were breaking up overhead allowing dappled light to touch down across the grand scale of the landscape. At one moment we’d be hiking in the brilliant sunshine while the peaks around us were enshrouded in the shadow of the clouds, the next moment it would be completely opposite with the distant peaks aglow starkly contrasted by darkness in the surrounding valley. The kids moved quickly that day. They could smell the barn. But the barn in this case was an air-conditioned coach with soft seats and a hiatus from the thick swarm of flies that had magically appeared in the last few days of the trip. We reeled the group together for the final hundred meters to link arms in a long line and strode proudly through the amber waves of parched wild knee-high grass while singing “The Boogaloo,” a song Carl taught the group a few days ago. The song ended just as our march to the busses ended and the kids streamed onboard their modern chariot with grins of joy – either to be done with the walk or by their accomplishment. Or a pleasant mix of the two.